Forming a 1-2 punch with Amari Cooper for the Oakland Raiders, Michael Crabtree has scored 25 touchdowns over the past three seasons. Only four players have more during that span -- Pittsburgh's Antonio Brown (31), Seattle's Doug Baldwin (29), Houston's DeAndre Hopkins (28) and New York's Odell Beckham Jr. (26). Crabtree also ranks 12th in receptions (232) and 20th in yardage (2,543) as well as ninth in targets (392) over that stretch. One positive as he joins the Baltimore Ravens, Crabtree goes from being one of the top guys to the top guy. In addition, the team's wide receivers are nearly completely turned over. Not only did the Ravens sign Crabtree, but they also brought in John Brown and Willie Snead in free agency and drafted UCLA's Jordan Lasley (fourth round) and New Mexico State's Jaleel Scott (fifth). Both Brown and Snead have had 900-yard campaigns in previous years, but they are each coming off disappointing seasons. Snead had just eight catches for 92 yards in 11 games last season while it's uncertain what the Ravens will get from Brown, who had 21/299/3 over 10 games last season. With lots of new receivers on the roster, that means that most of the team's top receivers are gone. All three of the team's leaders in receiving yards -- Mike Wallace (52/748/4), Ben Watson (61/522/4) and Jeremy Maclin (40/440/3) -- are no longer on the roster. Neither is Michael Campanaro (fourth among WRs in yards). Meanwhile, Breshad Perriman (fifth) may not be either if the Ravens decide to move on before paying him a $650,000 roster bonus due early in training camp. Either way, the top returning wide receiver is Chris Moore (18/248/3 on 38 targets). Nearly 60 percent of the team's 2017 targets are no longer on the roster. Crabtree missed two games in 2017 and had three-year lows in targets (101) last season. With a less talented "No. 2" receiver in Baltimore than Oakland, I project Crabtree to have close to his 2015/2016 target totals (146/145) in 2018. Even though the Ravens used the last pick of the first round on former Heisman winner Lamar Jackson, I expect Joe Flacco to start the entire 2018 season. If Flacco and the offense struggles, an in-season switch to a rookie quarterback could lead to even more conservative play calling and more weekly inconsistency out of the passing game overall. Based on the fantasy points allowed in 2017 of Baltimore's 2018 opponents, Crabtree and the Ravens wide receivers have the 21st-most favorable fantasy football strength of schedule. That said, no team has a more favorable schedule during the fantasy playoffs (Weeks 14 to 16) as Baltimore with matchups against the Chiefs, Buccaneers and Chargers. The Buccaneers (most) or Chiefs (second-most) allowed the most fantasy points to opposing wide receivers in 2017. 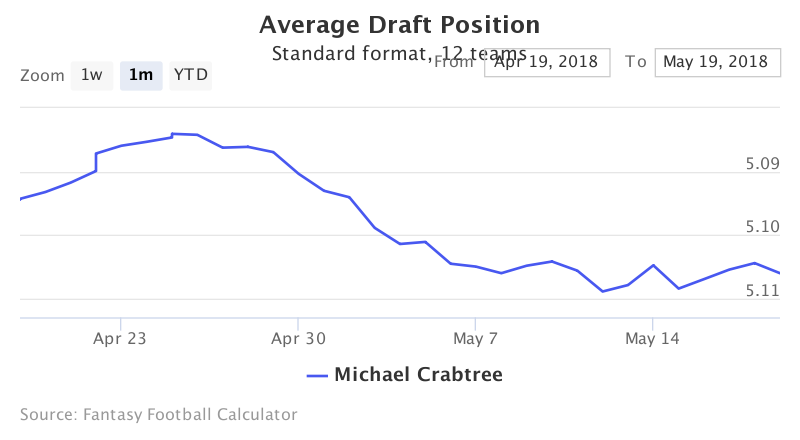 Based on current average draft position data from FFC, Crabtree is being selected at the end of Round 5 and as the 25th wide receiver off the board, on average. The other wide receivers off the board before/after Crabtree include Jarvis Landry (WR22), Jordy Nelson (WR23), Golden Tate (WR24) and Sammy Watkins (WR26). Perhaps I'm completely wrong, but Crabtree is 10 spots higher in my current rankings (WR16) than his FantasyPros Expert Consensus Ranking (WR26). In fact, no ranking (other than mine) is higher than WR18 (as of 5/19). Currently drafted as a high-end WR3 in Round 5, Crabtree offers plenty of profit potential for fantasy owners. Ideally I'll secure two stud running backs in the first two to three rounds of fantasy drafts. If so, I'd be more than comfortable if I land Crabtree as my WR2 in Round 5. Good luck in your 2018 fantasy football leagues! To keep track of our updates: (1) follow us on Twitter, (2) LIKE us on Facebook and/or (3) add us to your Google+ circle.